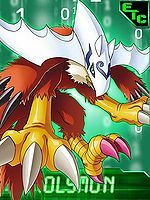 An Armor-level Beast Digimon that evolved through the power of the "Digimental of Love". 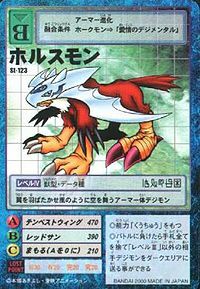 The "Digimental of Love" has the attribute of "Wind", and those that don this Digimental soar through the skies and dance in the sky flapping their wings like a gust of wind. 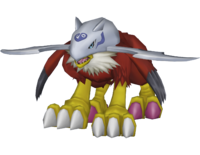 In aerial dogfights, its speed, and all of its attacks are superior to enemy Digimon. Its Special Moves are producing a shock wave from its wings (Mach Impulse) and spinning its body to generate a gigantic tornado (Tempest Wing). Its Signature Move is a cursed beam, fired from a sharp glance of its eyes (Udjat Gaze). A Beast Digimon that evolved due to the Digimental of Love. 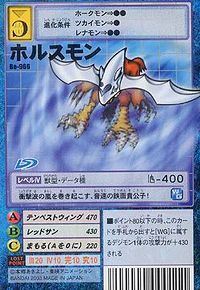 Special Moves - Produces a shock wave from its wings (Mach Impulse) and spins its body to generate a gigantic tornado (Tempest Wing). Its Signature Move is a cursed beam, fired from a sharp glance of its eyes (Udjat Gaze). 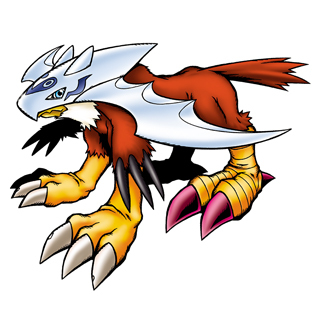 A Beast Digimon that Armor-evolved from Hawkmon with the power of the Digimental of Love. It is able to fly about freely through the sky with its silver wings. Its Special Move is attacking the opponent with a shock wave fired from its wings (Mach Impulse). A Beast Digimon that specializes in aerial combat. Its Special Move is producing a shock wave from its wings (Mach Inpulse). Title: 「はばたく愛情」 — "Flapping Love"
| Horus was a hawk-headed Egyptian god. Halse is a corruption of Horus. Fires an energy blade from the wings on its helmet. Tempest Wing  テンペストウィング Tenpesuto Wingu Tempest Wing Spins its body to generate a tornado. Udjat Gaze  ウジャトゲイズ Ujyato Geizu Evil Gaze Sends hypnotic waves at the foe from its eyes. Red Sun  レッドサン Reddo San Eagle Eye, Red Sun Shoots laser beams from its eyes. Holsmon is the partner of Inoue Miyako. 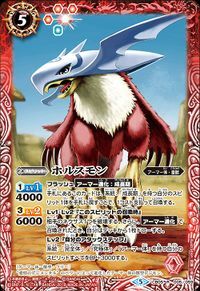 May evolve from Hawkmon if level 11 or more with Digimental of Love. Holsmon is only obtainable as a collectible card. 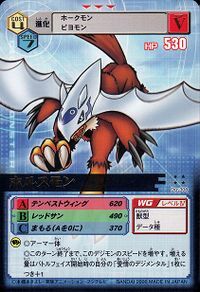 Its card is part of the Digimental of Love (愛情のデジメンタル, Aijou no Dejimentaru) set. Holsmon is available as a Digimon Medal. 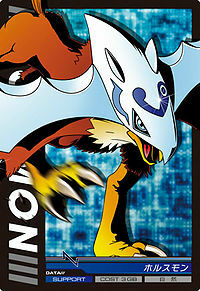 Holsmon evolves from Hawkmon using the Digimental of Love. 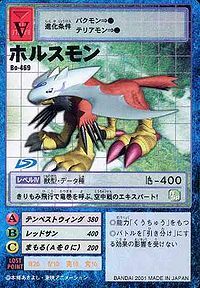 An Armor level Digimon which flaps its wings and dances in the sky like the wind. An expert in aerial battles, it calls upon twisters with its tailspin! This iron-masked prince flies at the speed of sound, whipping up a storm of shockwaves! 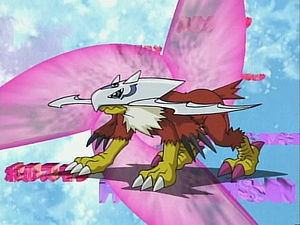 The Armor Evolved form of Hawkmon using the Digimental of Love. Possessing the wind element, it dances in the skies like the wind with a flap of its wings, and specializes in aerial battles. 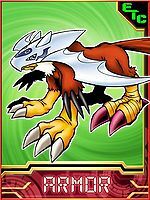 An Armor-level Beast Digimon that evolved through the power of the "Digimental of Love". ↑ Digimon Adventure 02: "Dangerous Picnic"